What do I mean when I state the Grand Connection? Mind, Body Spirit? Yup! Human Beings, Creatures, Plants and The Earth? Yup? Us and Them? You and Me? AS above so Below? Yup, Yup, Yup! For six years I have racked my brain to find safer options for our space, more nurturing services, deeper meaning to what we do, farther reaching positive impact for our efforts to educate and more effective ways to show the connection between all of the above! We have the joy and privilege to add yet another Canadian made product to our list of healthier alternatives for hair and skin care! The conditioner can be used as a moisturizer, leave in or wash out, heat protector smoothing product and more! We are learning more and more as we use it! The hair spray contains natural sugar and is a pump instead of an aerosol. 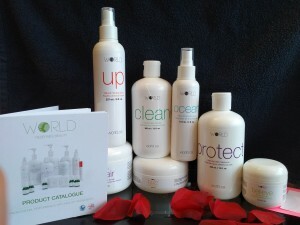 The whole line contains everything you need to simplify and beautify! Want to learn more? Pop in for a consult and learn more about how WORLD products can shift your awareness! I am so happy that almost 75% of our lines are Canadian made and that more and more our Manufacturers and Suppliers are keeping in step with our efforts to connect the dots to how what we use on our hair and skin directly impacts our eco system! I love how I have less people telling me I’m crazy and more people jumping on the train to sustainability! Everything is connected, Mind Body Spirit, Our Choices and the impact on others and the planet. Take REspons-ability for what you say, do and react like. This is your legacy! What will you leave behind? An oil slick or a beautiful garden?